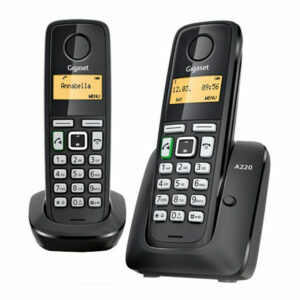 The Gigaset A220 handsets are the ideal home phones. With plenty of features including hands-free conversation, plus a reasonable pricetag, you can’t go wrong. The display is illuminated and easy to read, plus you can save up to 80 contacts, see who is calling on the caller ID, and make hands-free calls. The battery life on these phones is huge, lasting up to 200 hours (more than a week) on standby and up to 18 hours while calling. They are suitable for anyone with a landline or VOIP connection. We’re offering these great-value handsets for just 66.55€ (incl. IVA). You can pick them up at our Moraira office or we can send them to you if you’d prefer. Get in touch now to order yours – call 965 743 473 or 902 889 070, email sales@telitec.net, or fill out the Tell me More form on this page and we’ll get back to you.